The ganglion impar nerve block is used to treat pain associated with the very low back and tailbone region. The block involves injecting the nerve region with an anesthetic or neurolytic agent. The ganglion impar is a bundle of nerves that lie in front of the sacrum/coccyx joint. 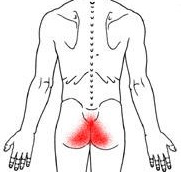 Any over-activity of these nerves can cause chronic coccyx pain. These nerves are part of the sympathetic nervous system (SNS), which is involved with prolonged or extreme pain signals. The ganglion impar block using an anesthetic can give the patient temporary relief of coccyx pain. Once the anesthetic wears off, the pain is of a lower level than previously. Repeat injections often eliminate the pain. The block is a minimally invasive procedure, done outpatient, and offers pain relief for people who do not respond to medications. The sympathetic nerves are temporarily blocked using a local anesthetic such as bupivacaine or lidocaine. To destroy a portion of the nerve, and offer longer lasting results, a neurolytic agent is used, such as phenol or alcohol. A block involves stopping the nerves from carrying electrical signals to the brain. Therefore, the patient does not perceive the pain. What do I do to prepare for the ganglion impar block? A sedative is used during the procedure, so you must arrange to have someone drive you home. In addition, do not eat or drink for 8 hours before your scheduled appointment time. Necessary medications are permitted with small sips of water. You should notify the doctor of what medications you take, as certain agents that can make the blood thin are held beforehand. In addition, expect to be off from work for 2-3 days, as you should rest and gradually return to usual duties. The patient is positioned lying on the procedure table. The skin over the lower abdomen is cleaned with an antiseptic. The procedure needle is inserted using fluoroscopy, which means x-ray guidance. This assures correct needle placement. After the medication is injected onto the nerves, the needle comes out, and a bandage is applied to the injection site. What happens after my ganglion impar block procedure? A nurse monitors your vital signs as you awake from sedation. Expect to have dry mouth, dizziness, and grogginess, which only last a few hours. Once you are alert, you are permitted to leave. You should avoid heavy lifting and rigorous activities for a few days. The block can cause a full sensation of the lower back and pubic region. According to a recent clinical study involving patients with coccydynia, the ganglion impar block offered complete pain relief. The researchers found the block to have a 100% success rate.